The conference takes place at the elegant Sofitel Berlin Kürfurstendamm, and is situated at the heart of the City West area, within striking distance of the renowned Kurfürstendamm shopping quarter. A showcase for a unique fusion of art, architecture and design, the impressive 17-story stone façade constructed from Kirchheim shell limestone is a real eye-catcher. 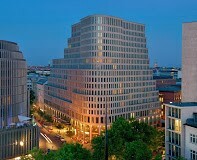 Breathtaking views can be enjoyed from Sofitel Berlin Kurfürstendamm across the vibrant city of Berlin. During the years that Berlin was divided, this area was the center of West Berlin. Reminders of the city’s history surround the hotel, from famous Café Kranzler to the Kaiser-Wilhelm Memorial Church. Click here to book your hotel room right away! The conference will take place in the beautiful Sofitel Berlin Kürfurstendamm, walking distance to luxury shopping and cultural highlights. We have booked a block of rooms at a discount rate of 160 Euro for single occupency. Rooms are available until 22nd of March (or until the room block sells out). Berlin has two airports: Tegel and Schönefeld. Tegel is much closer to Berlin center. A taxi ride from Schönefeld to the hotel will be around 55 EUR, from Tegel airport around 25 EUR. The closest train station to the Sofitel is Zoologischer Garten Bahnhof. Direct trains from Schönefeld Airport and buses from Tegel Airport (Bus X9, each 10 minutes) arrive at Zoologischer Garten Bahnhof, a few minutes’ walk away to the hotel. The hotel arranges also private pickups, please contact the concierge of the Sofitel.